Reaping Decoys like the MOJO Scoot’N Shoot Offers an Adrenaline Packed Experience. During the 2016 spring turkey season, I had the opportunity to experience the adrenaline rush of “turkey reaping.” I had heard Midwestern turkey hunters speak of this ultimate rush in turkey hunting. Being from Alabama, the state of extremely wary Eastern Turkey, I did not have the opportunity to hunt this style. A few hunters I know have tried it in the southern states with less than favorable results. The MOJO Scoot’N Shoot decoy is a life-size replica of a mature tom. 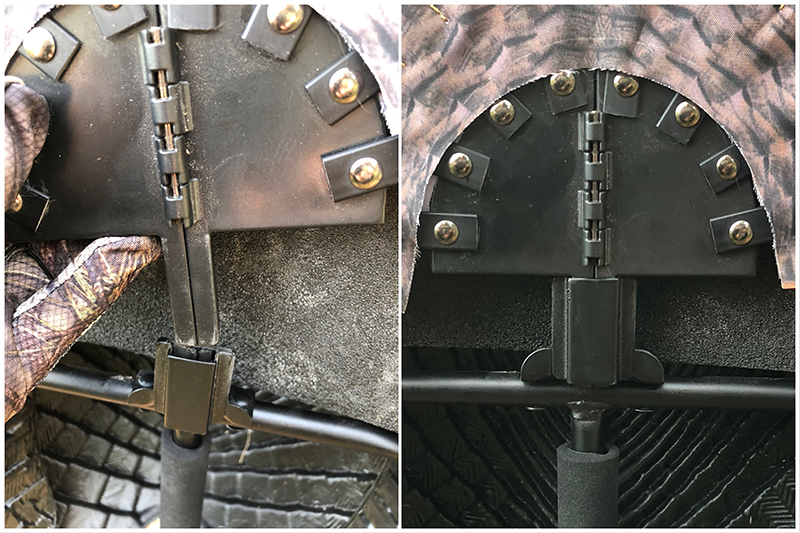 For convenience in size, the decoy is only the front portion of a tom, with semi-rigid flared wings for added coverage of the user. 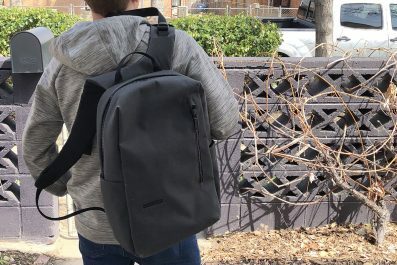 The decoy has a built-in handle with a foam cover for ease of carrying and reaping. 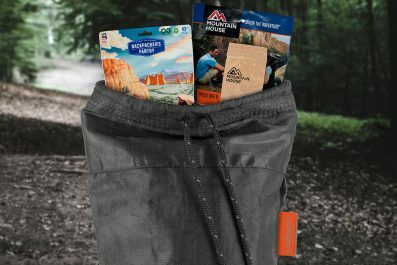 The handle converts to a ground stake that is safely attached, so it stows away easily. I was excited about this new experience, albeit a little nervous. It was not initial my intention to let the bird come right up into my lap. I wasn’t hunting with the right gun, choke, and ammo combination for that. The JEBS Headhunter choke with Winchester Long Beard XR ammo was patterned to reach out there and touch those toms in Midwestern terrain. As tight as my shotgun was shooting it would not take much more than a bobble to clean miss a turkey sitting at the end of my barrel. I know this because it happened on the first mature Tom that my guide reaped into shooting distance. That tom came in looking to fight as his two hens came running up to the infringing tom. That bird wasn’t three good steps off the end of my gun barrel, and three shots later, he was nothing but a memory. Fortunately, I had another opportunity later that day. The guide spotted two toms strutting in a field about 300 yards away. There were no hens with these two mature toms, and the guide mentioned that the best he could tell they were Merriam’s. He felt we had a good chance at reaping these birds from across the field. This is where turkey hunting took a whole new twist for me. Back home, we would have used the terrain to cut the distance between the birds and us. I almost had my doubts that these birds were going to make their way to us, and if they did, I felt it was going to take a while. This was not the case. As I quickly sat down, shouldering my gun, I thought that at the distance the birds were from us. It would take a few minutes for them to get to us. OH CONTRAIRE!! As I was looking out across the vast agricultural field, I saw the two birds at a dead run, beards swinging from left to right, and breast jiggling as the sun reflected off of their feathers. One tom would take the lead long enough for the other to dig in and gain a little ground to pass the other as if in a race to be the first one to a taped finish line in a marathon. I have never seen toms running into a decoy setup as quickly as these two were. I aimed on the bird with the whitest band, reflecting he was a true Merriam’s, and I squeezed the trigger. It fell to the ground, flopped its wing a few times, and he was done. Whew, what a rush! 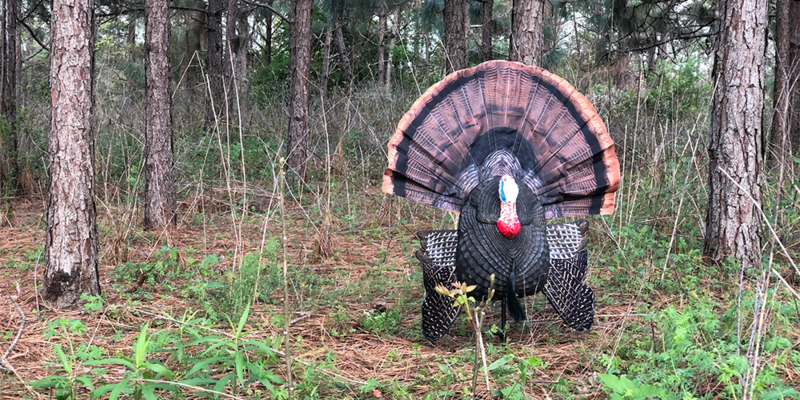 Although this hunt was not in the true reaping fashion, it was evident that the action from the Scoot’N Shoot was definitely what grabbed the attention of these two toms, and it is surely what intrigued them to come clear across a field from 300 yards. After some photos, I was talking with the guide about the success that he has had with the MOJO Scoot’N Shoot. He said that he had birds come running up to the decoy and nearly bump into it. 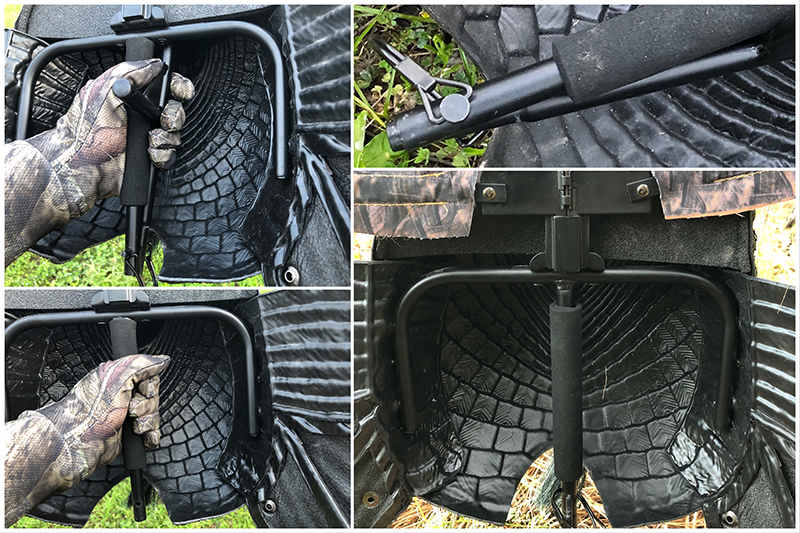 He liked the fact that the decoy was easy to carry, incorporated a ground stake when needed, and that he could use a real tail which allowed him to rig a camera into the tail fan. 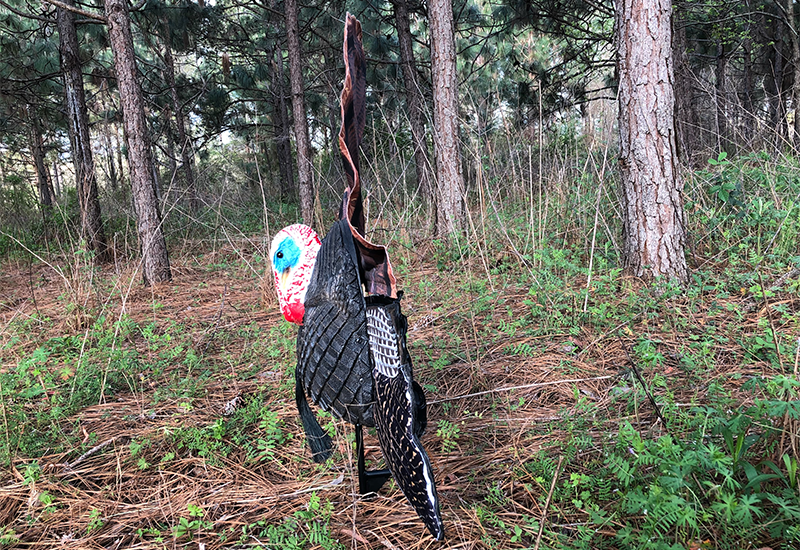 The MOJO Scoot’N Shoot is a convenient sized lifelike mature gobbler measuring 16”x15”x13” that is lightweight at .7 pounds, allowing for easy carrying in and out of the woods. 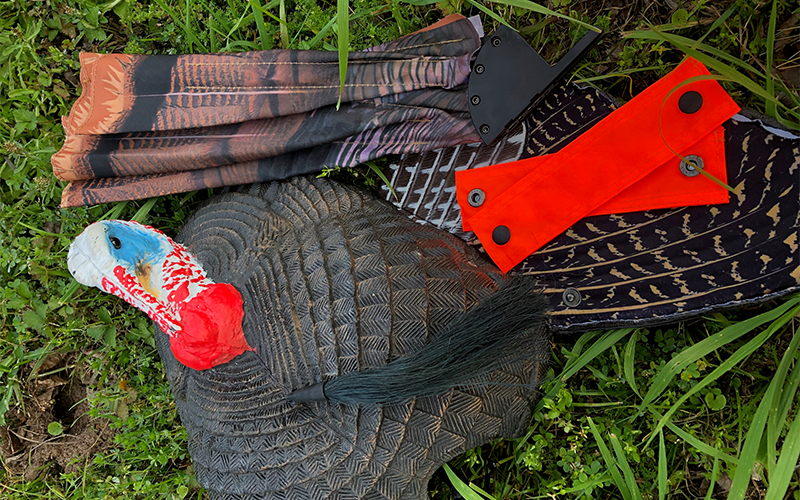 The semi-rigid wings fold easily to stow the decoy in the back of a turkey vest. The decoy is designed to be dual-purpose, a reaping decoy and a ground staked, stationary decoy. The removable tail offers a hub attachment that can accommodate a real tail fan which makes it ideal when hunting various species. A synthetic 3-D printed foldable tail fan is included. 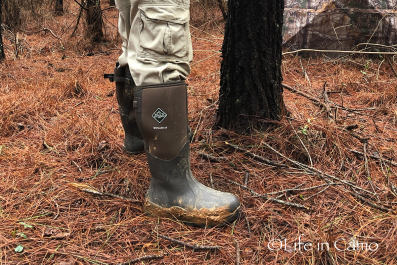 The semi-rigid, flared wings offer additional coverage for the hunter when mobile with the decoy. The wings incorporate snaps to attach a set of hunter orange strips for safety when carrying the decoy in and out of the woods. The stake employs a cotter pin to secure the ground stake for use and for stowing. The Scoot’N Shoot proved to be an effective reaping decoy useful for enticing henned-up toms and has the versatility of being a stationary staked decoy that can be handheld to cut the distance between the hunter and mature toms and then quickly staked in the ground for a set up to call the birds in.